As the inventor of the PassPorter concept and planning system, most people tend to think I’m an uber vacation planner. But if you know me at all, or listen to the PassPorter Moms podcast, you’ll discover quickly that these days I rarely plan anything far in advance. Scandalous, I know! As a work-at-home mother, business owner, writer, and coder, my life is jam-packed and I am quite content to “wing it” most of the time. 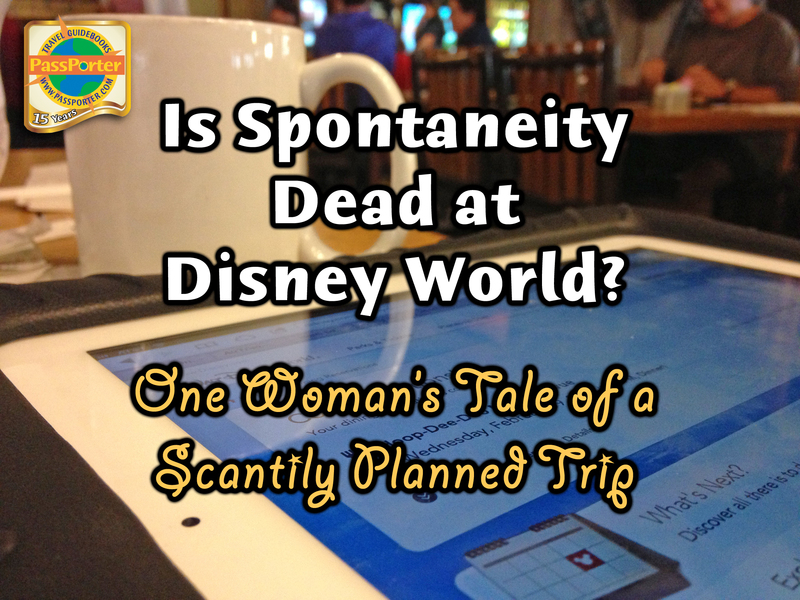 With all the new technological changes like FastPass+ and MyDisneyExperience, I’ve been hearing the lamentations of some that spontaneity and last-minute Disney vacations are a thing of the past. Some folks say that you have to plan a year (or more) in advance, get all your dining reservations and FastPass+ times right at the release dates, and generally map out your days well in advance. There’s certainly nothing wrong with planning, and I happen to think it’s quite fun when I have time for it … but is advance planning absolutely necessary to a fun Disney vacation? Let me tell you the story of our recent vacation and you can decide for yourself. On January 15, I glanced at the calendar and realized my son’s mid winter break was approaching fast on February 14. It was less than a month away! I remembered I’d wanted to get to Disney during this time period — an escape from the brutal Michigan winters can do a lot for moral around here. So that afternoon I poked around DisneyWorld.com and checked out prices — essentially shopping for what looked fun and reasonable. I noticed the Fort Wilderness campground and remembered an e-mail I’d gotten from Florida Camper Rental. Maybe I could get an RV and camp at Fort Wilderness, I thought. I also poked around DisneyCruise.com to see if they had any upcoming cruises at good prices, and they did. I dashed off an e-mail to Sara, who arranges my travel, and Florida Camper Rental to see if I could make a booking. I heard back from Sara within 20 minutes (she’s amazing) and Florida Camper Rental soon after that (also impressive). Within the space of a day, I had a three-night stay at Fort Wilderness with an RV and a three-night Disney cruise BOOKED for one month away. During Peak Season, I might add. Then I went back to work and got distracted from my trip. I didn’t pick it up again until I remembered I really needed to GET to Orlando. On January 21, I began searching for flights. Thanks to Kayak.com, I identified Southwest as being the lowest fare carrier for the period I wanted to travel and I booked flights for $250 each (a good price these days). 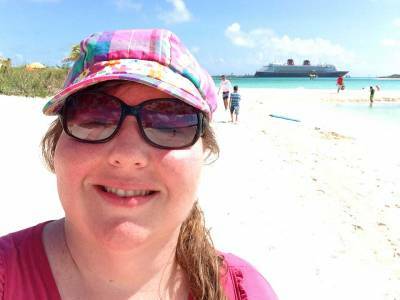 I ended up booking a flight that came home one day later than our cruise to save money (flexibility in travel dates helps in this regard), so I poked around on the DisneyWorld.com site again to see where I could stay for one night. The value resorts were available, but I decided to splurge with one night at the Grand Floridian Villas — super pricey places like that work well for short durations at the end of a trip. I sent off another e-mail on January 23 and Sara got me booked in the Villas as well. I now have just 25 days until my trip. Land and sea vacation booked and ready to go!I got my reservation confirmation numbers quickly and linked up my reservations in MyDisneyExperience (I love that part!). I then picked out our MagicBand colors (green for me!). That took maybe 10 minutes. I made sure I knew where our passports were and set them aside. Then work intervened and I went off to do other tasks unrelated to my trip. Life happened for some time. It has a way of doing that! I didn’t return to MyDisneyExperience until, oh, the day before our trip? The trip was now just one day away and I’d made no dining reservations, no FastPass+ reservations, and no cruise excursion reservations. I think this might freak some people out. I felt pretty calm about it, though. One might ask why I hadn’t bothered to make any reservations, and it really has a lot to do with my preferences and personality. I like unstructured days that allow me to pursue what is important at the time. I like spontaneity. I like getting an idea at 9 am and running with it, rather than having to wait until I can fit it into my schedule. It’s how I work, and it’s how I play. So the day before my trip, I went to MyDisneyExperience and looked for some fun places to dine. Neither I nor Alexander have must-visit places at Disney, so anything is fair game. I checked out Hoop-Dee-Doo Revue and saw that there was availability, but didn’t book — I wasn’t sure yet if it would fit in with our plans. Ultimately I made just two dining reservations — one for Narcoosee’s around fireworks time and one for 1900 Park Fare the next morning. I figured if I’m staying at the Grand Floridian, I should eat there, too. Did I make FastPass+ reservations? Nope. I think I got pulled back to work or something. I could have returned later, but clearly, it wasn’t a big priority for me. Wednesday Breakfast: Trail’s End (walkup, no wait). While we were at breakfast, I decided today would be a good day for Hoop Dee Doo Revue after all. I checked MyDisneyExperience and got a reservation for 8:30 pm while I drank my coffee. Wednesday Park: Magic Kingdom without advance FastPass+ — I didn’t even use the app. I walked into the park, saw that it was crazy crowded, and decided this was a good day to test out using the FastPass+ kiosks so I could get an idea of the FastPass+ experience for non-resort guests. I ended up waiting for 30 minutes for a kiosk in Tomorrowland and got ride reservations. I later learned that other kiosks were significantly less crowded. But that’s a blog post for another day! Suffice it to say we got FastPass+ for Barnstormer and Dumbo The Flying Elephant and rose them both before we called it a day and went back to Fort Wilderness. Thursday Park: Epcot — I used the MyDisneyExperience app that morning while I was on the bus to the park that morning to make reservations for Soarin, Living with the Land. We ended up missing Soarin (because I had extra work to do that morning) and went back to Fort Wilderness early (because I was coming down with a cold and needed rest). Friday Breakfast: Trails End again (we couldn’t resist, it was so good!) No reservation, walked up and got in right away. Monday rides: Again, I made FastPass+ reservations on the way over. I made sure to get Soarin again, plus Spaceship Earth and Mission:Space. 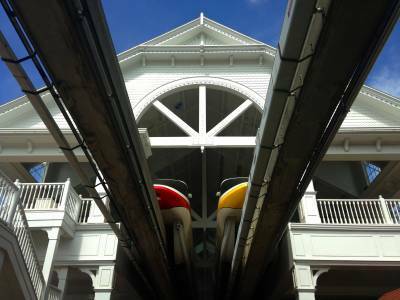 Other than those two dining reservations I’d made six days in advance, we ate where and when the mood struck us, and rode the rides at the parks we picked that morning. It felt free and fun, and it suited my personality! The parks were busy, but we still managed to have a great time without a great deal of advance planning. Spontaneous S’mores at Fort Wilderness!The two secrets to the success to this method: Information and Help! 1. Information: I may not be advance planning, but I KNOW Disney. You don’t have to be a guidebook author to know Disney, of course — you just need to find a few good sources of information and read them. Knowledge is definitely power when it comes to Disney! I bring a PassPorter with me and I refer to it when I need it — there’s a reason I wrote a book: I can’t remember everything! I also use my iPhone to check things during my trip. 2. Help: I have Sara, a wonderful travel planner who also knows Disney, who is responsive, and who helps me make reservations. It saves me a lot of time. You can have a Sara, too! I highly recommend travel planners. Anyone can use them, and the good ones have no fees. MouseFanTravel.com and MouseEarVacations.com are the two I recommend. It’s important to use a travel planner who specializes in Disney vacations. Without these, I don’t think I could do this. But if you’re thinking about going to Disney soon and are worried there’s just not enough time to plan a great trip, don’t let this hold you back — just arm yourself with knowledge and team up with a travel planner! Remember, too, that I looked for what sounded fun from what was available, rather than having my heart set on something specific. The mantra was repeat on the podcast, “Do Less, Enjoy More” really applies here. I didn’t plan a lot, and that allowed us to really enjoy more when and where we felt like it. Me having a fun and relaxing time on my trip! So there you have it — a seven-day land/sea vacation during peak season booked less than a month in advance and with virtually no day-to-day activity/dining reservations. We had a fabulous time, despite my scandalous lack of planning! This was one of my better trips, in fact. We felt pretty much footloose and fancy free! The little stress I encountered was unrelated to my lack of advance planning; it was due mostly to the lack of service at the Grand Floridian Villas. But that’s a topic for another blog post! To be fair, it seems like most of your meals were either counter service or eaten in the RV. Other than the cabana, did you do any other excursions? I don’t like the idea of scheduling fastpasses that late, but I would worry that I wouldn’t get the ones I wanted. We don’t get to go as often as you do, so there are must-dos for us and I wouldn’t want to chance that by trying to be so “carefree”. Still, it is an option for those who can afford to go all the time and are more flexible. I just don’t think it works as well for those who only get to travel to Disney every couple of years. I usually plan nothing but what park we are going to on which day & I use crowd calendars for that. This year I did make reservations for Trail End, although we’ve never needed them, because we are joining my cousins there & wanted to make sure we got in. I never do FassPass. Scandalous I know but I’ve never felt cheated by missing something that has a long line. Since my mom isn’t a rider, me standing in line gives her time to rest which lets us extend our time in the parks. Last year I planned our trip in 10 days. Was fairly easy since I keep up with what’s going on at Disney though FB posts & Passporter articles & forums & the guide book of course. I used the My Disney Experience app last year for wait times which I used extensively. 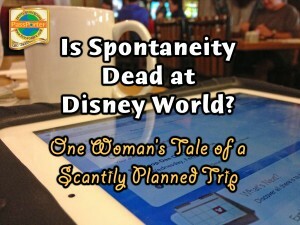 If we had a lull, I would check to see what had low wait times & that’s where we would head. I like spontaneity. I cringe when I see tips that say you must have ADRs & FassPass. I feel like ADRs & definitely FassPasses would ruin my trip because I would be so concerned about getting there on time that enjoying the Disney experience would be lost. I’m already freaking out on how I’m going to get from Animal Kingdom to Trail’s End by our 6:45 pm reservation that I hope it doesn’t ruin my AK day. We’ve done trips where we have planned every detail and also where we’ve played bus “roulette” to pick what park we are headed to first. We’ve enjoyed every trip, but the one where we just had no plan (other than dinner ADRs) was the most fun and relaxing one for us. We didn’t feel any pressure to constantly rush from attraction to attraction. If people can do it, I highly recommend it for a change of pace. Great to see someone else just wing it. Living here in Florida and having an annual pass we often go up with a week notice. Try to pick one nice sit down dinner the rest of it is where we are and we are hungry. I feel some people try to get too organized and don’t take time to smell the flowers. I realize they are trying to get their money’s worth but if you are running around to get here or there at a certain time you miss the little things that make Disney Magical. Often will just grab a snack and sit enjoy what is around. I think it is easier to be spontaneous when you have been there more. I know that at first, we couldn’t do/see it all & that’s one of the things that had us coming back. As we’ve seen those things again, it’s easier to not be on such a schedule & actually absorb the surroundings, allowing ourselves to enjoy – more! ← Renting an RV at Disney’s Fort Wilderness: Florida Camper Rental is Darn Tootin’ Good!